The Waterford Sanitary District (WSD) is an independent governmental body that provides for the collection and transmittal of wastewater for the District residents in the Town of Waterford. The District’s sewer system became operational on August 1, 1988. At that time we served approximately 1,100 customers. Today we serve over 1,925 homes and businesses. Several sewer extensions have been added over the years, primarily in new subdivisions. All of these extensions were added by developers or property owners at no cost to the District. Quarterly bills carry a rate of $39.86 per month for each single family home. Each quarterly bill is $119.57 for each resident that includes those that have district owned grinder pumps. 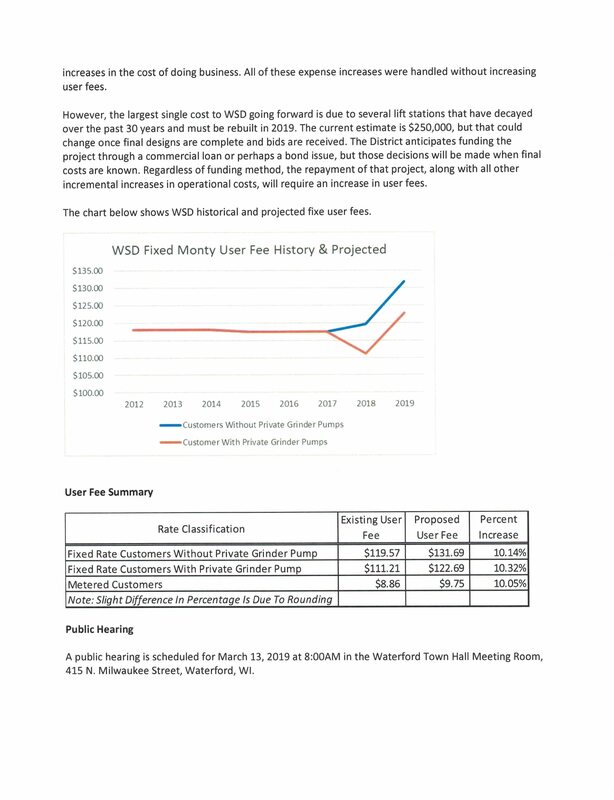 For our customers that have privately owned grinder pumps, the quarterly billing rate is $111.21 (37.07 per month)Commercial businesses can chose between multiple user fees or have a meter and pay according to actual usage. 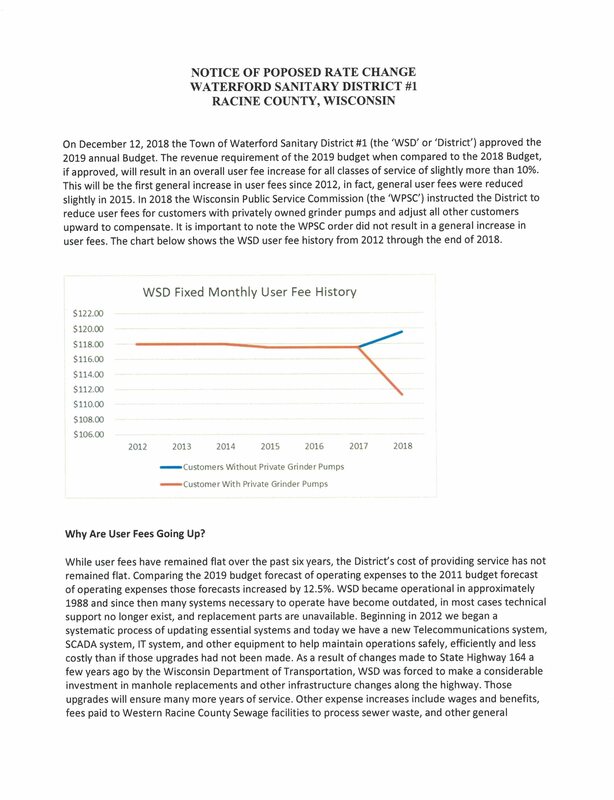 The sewer charges are based on costs for operation and maintenance of the system, treatment costs paid to Western Racine County Sewerage District, and capital expenditures. Our quarterly invoices will come on a regular sized 8 x 11 inch sheet of paper with a tear-off payment ticket attached at the bottom of the page. Theses bills come to you in the mail in a regular sized envelope. Bills are mailed at the end of each quarter, on or about the first of April, July, October, and January, and are due on the 20th of the respective month. Payments must be received or postmarked by the due date or a 5% penalty will be added to the bill. In addition, any amount that is not paid in full by November 1st of any year is subject to a 10% surcharge and, if not paid by November 15th of that year, the total amount is then placed on the property tax bill for collection. IF YOU SELL YOUR HOME PLEASE CALL OUR OFFICE TO PROVIDE US WITH THE NEW OWNER’S NAME. THAT WILL ELIMINATE THE CONFUSION OF BILLS BEING FORWARDED AND THE NEW OWNER NOT RECEIVING THEM. WE NEED YOUR HELP TO KEEP THIS INFORMATION CURRENT! 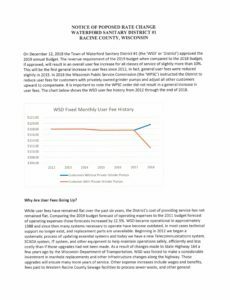 RACINE COUNTY DOES NOT NOTIFY OUR OFFICE OF ANY PROPERTY TRANSFERS. Since remodeling the Sanitary District owned municipal building in 2000, it has allowed all municipal departments the room to grow along with our community. 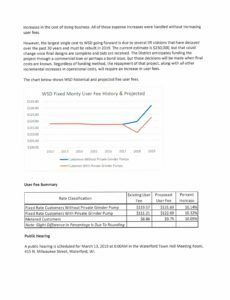 The Sanitary District rents the portion of its building used by the town to the town for $1.00/year on a 99-year lease and extends the use of the meeting room to community based organizations at no charge. Disclaimer: This is not an official posting site of the Town of Waterford Sanitary District. Just a reminder that this website is not updated every day. It is NOT an official posting site and is for information only. There may be times when the site is not updated. We make every attempt to do so when time allows. You can always contact the office with any questions you may have.